Join conductor John Nelson, mezzo-soprano Joyce DiDonato, and tenor Michael Spyres for an exclusive interview marking the release of their new Erato – Warner Classics recording of Berlioz's epic opera Les Troyens! 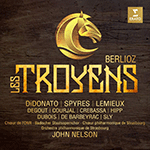 Berlioz never saw his epic five-act opera Les Troyens performed in its entirety. In its uncut version, the opera runs four hours, and because a full production demands huge musical and theatrical forces, few opera houses dare to undertake it: even its 1863 Paris premiere by Léon Carvalho's company featured only the last three acts and those with extensive cuts! In Strasbourg in April 2017, a magnificent cast of singers—led by Michael Spyres as Énée and Joyce DiDonato as Didon—was brought together under the baton of Berlioz-specialist John Nelson for two complete concert performances of the work. The new album blends together the highlights of those performances to produce one incomparable recording of Berlioz's uncut score. In this special event, Gramophone magazine's Editor-in-Chief James Jolly interviews Nelson, DiDonato, and Spyres, delving into Berlioz's masterpiece and into the creative process it took for these artists to produce the performances. Don't miss this exciting evening! Joyce DiDonato appears courtesy of Erato – Warner Classics. Broadcast date: Nov. 26, 2017, 5:30 p.m.